Liczba stron: 417 Jest to ujednolicona liczba stron, która ułatwi Ci porównanie długości książek. Każda strona Legimi to 200 słów. “Vanity was the beginning and the end of Sir Walter Elliot's character; vanity of person and of situation. He had been remarkably handsome in his youth; and, at fifty-four, was still a very fine man. Few women could think more of their personal appearance than he did, nor could the valet of any new made lord be more delighted with the place he held in society. He considered the blessing of beauty as inferior only to the blessing of a baronetcy; and the Sir Walter Elliot, who united these gifts, was the constant object of his warmest respect and devotion. His good looks and his rank had one fair claim on his attachment; since to them he must have owed a wife of very superior character to any thing deserved by his own. Lady Elliot had been an excellent woman, sensible and amiable; whose judgement and conduct, if they might be pardoned the youthful infatuation which made her Lady Elliot, had never required indulgence afterwards.--She had humoured, or softened, or concealed his failings, and promoted his real respectability for seventeen years; and though not the very happiest being in the world herself, had found enough in her duties, her friends, and her children, to attach her to life, and make it no matter of indifference to her when she was called on to quit them.” “Persuasion” by Jane Austen was first published in 1817. 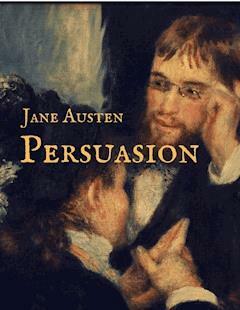 It is the last fully completed novel by Jane Austen. "Yes; it is in two points offensive to me; I have two strong grounds of objection to it. First, as being the means of bringing persons of obscure birth into undue distinction, and raising men to honours which their fathers and grandfathers never dreamt of; and secondly, as it cuts up a man's youth and vigour most horribly; a sailor grows old sooner than any other man. I have observed it all my life. A man is in greater danger in the navy of being insulted by the rise of one whose father, his father might have disdained to speak to, and of becoming prematurely an object of disgust himself, than in any other line. One day last spring, in town, I was in company with two men, striking instances of what I am talking of; Lord St Ives, whose father we all know to have been a country curate, without bread to eat; I was to give place to Lord St Ives, and a certain Admiral Baldwin, the most deplorable-looking personage you can imagine; his face the colour of mahogany, rough and rugged to the last degree; all lines and wrinkles, nine grey hairs of a side, and nothing but a dab of powder at top. 'In the name of heaven, who is that old fellow?' said I to a friend of mine who was standing near, (Sir Basil Morley). 'Old fellow!' cried Sir Basil, 'it is Admiral Baldwin. What do you take his age to be?' 'Sixty,' said I, 'or perhaps sixty-two.' 'Forty,' replied Sir Basil, 'forty, and no more.' Picture to yourselves my amazement; I shall not easily forget Admiral Baldwin. I never saw quite so wretched an example of what a sea-faring life can do; but to a degree, I know it is the same with them all: they are all knocked about, and exposed to every climate, and every weather, till they are not fit to be seen. It is a pity they are not knocked on the head at once, before they reach Admiral Baldwin's age." It seemed as if Mr Shepherd, in this anxiety to bespeak Sir Walter's good will towards a naval officer as tenant, had been gifted with foresight; for the very first application for the house was from an Admiral Croft, with whom he shortly afterwards fell into company in attending the quarter sessions at Taunton; and indeed, he had received a hint of the Admiral from a London correspondent. By the report which he hastened over to Kellynch to make, Admiral Croft was a native of Somersetshire, who having acquired a very handsome fortune, was wishing to settle in his own country, and had come down to Taunton in order to look at some advertised places in that immediate neighbourhood, which, however, had not suited him; that accidentally hearing--(it was just as he had foretold, Mr Shepherd observed, Sir Walter's concerns could not be kept a secret,)--accidentally hearing of the possibility of Kellynch Hall being to let, and understanding his (Mr Shepherd's) connection with the owner, he had introduced himself to him in order to make particular inquiries, and had, in the course of a pretty long conference, expressed as strong an inclination for the place as a man who knew it only by description could feel; and given Mr Shepherd, in his explicit account of himself, every proof of his being a most responsible, eligible tenant. He was not Mr Wentworth, the former curate of Monkford, however suspicious appearances may be, but a Captain Frederick Wentworth, his brother, who being made commander in consequence of the action off St Domingo, and not immediately employed, had come into Somersetshire, in the summer of 1806; and having no parent living, found a home for half a year at Monkford. He was, at that time, a remarkably fine young man, with a great deal of intelligence, spirit, and brilliancy; and Anne an extremely pretty girl, with gentleness, modesty, taste, and feeling. Half the sum of attraction, on either side, might have been enough, for he had nothing to do, and she had hardly anybody to love; but the encounter of such lavish recommendations could not fail. They were gradually acquainted, and when acquainted, rapidly and deeply in love. It would be difficult to say which had seen highest perfection in the other, or which had been the happiest: she, in receiving his declarations and proposals, or he in having them accepted. A short period of exquisite felicity followed, and but a short one. Troubles soon arose. Sir Walter, on being applied to, without actually withholding his consent, or saying it should never be, gave it all the negative of great astonishment, great coldness, great silence, and a professed resolution of doing nothing for his daughter. He thought it a very degrading alliance; and Lady Russell, though with more tempered and pardonable pride, received it as a most unfortunate one. Anne Elliot, with all her claims of birth, beauty, and mind, to throw herself away at nineteen; involve herself at nineteen in an engagement with a young man, who had nothing but himself to recommend him, and no hopes of attaining affluence, but in the chances of a most uncertain profession, and no connexions to secure even his farther rise in the profession, would be, indeed, a throwing away, which she grieved to think of! Anne Elliot, so young; known to so few, to be snatched off by a stranger without alliance or fortune; or rather sunk by him into a state of most wearing, anxious, youth-killing dependence! It must not be, if by any fair interference of friendship, any representations from one who had almost a mother's love, and mother's rights, it would be prevented. Captain Wentworth had no fortune. He had been lucky in his profession; but spending freely, what had come freely, had realized nothing. But he was confident that he should soon be rich: full of life and ardour, he knew that he should soon have a ship, and soon be on a station that would lead to everything he wanted. He had always been lucky; he knew he should be so still. Such confidence, powerful in its own warmth, and bewitching in the wit which often expressed it, must have been enough for Anne; but Lady Russell saw it very differently. His sanguine temper, and fearlessness of mind, operated very differently on her. She saw in it but an aggravation of the evil. It only added a dangerous character to himself. He was brilliant, he was headstrong. Lady Russell had little taste for wit, and of anything approaching to imprudence a horror. She deprecated the connexion in every light. Such opposition, as these feelings produced, was more than Anne could combat. Young and gentle as she was, it might yet have been possible to withstand her father's ill-will, though unsoftened by one kind word or look on the part of her sister; but Lady Russell, whom she had always loved and relied on, could not, with such steadiness of opinion, and such tenderness of manner, be continually advising her in vain. She was persuaded to believe the engagement a wrong thing: indiscreet, improper, hardly capable of success, and not deserving it. But it was not a merely selfish caution, under which she acted, in putting an end to it. Had she not imagined herself consulting his good, even more than her own, she could hardly have given him up. The belief of being prudent, and self-denying, principally for his advantage, was her chief consolation, under the misery of a parting, a final parting; and every consolation was required, for she had to encounter all the additional pain of opinions, on his side, totally unconvinced and unbending, and of his feeling himself ill used by so forced a relinquishment. He had left the country in consequence. A few months had seen the beginning and the end of their acquaintance; but not with a few months ended Anne's share of suffering from it. Her attachment and regrets had, for a long time, clouded every enjoyment of youth, and an early loss of bloom and spirits had been their lasting effect.